Donald J. Trump on Thursday released a wave of insults on main presidential rival Dr Ben Carson in a television interview comparing him to a child molester and saying the people of Iowa must be stupid to believe Carson's claims in his book that he tried stabbing a close relative with a knife during his early years.. 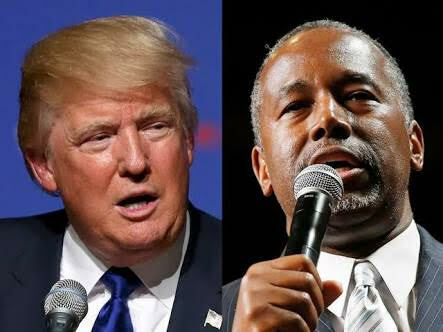 This twin tirades came two days after the fourth Republican presidential debate where Dr Carson moved ahead of Trump in polls by Republicans in Iowa and some national polls as well too. In Ben Carson's best-seller book, Gifted Hands, the doctor narrated how he nearly would have killed a friend with a knife who he later referred to as a 'close relative' while he was young and struggling with 'anger issues' if not for the waist belt of the relative that prevented the knife from stabbing through. For 10minutes, Trump went about angrily attacking his chief rival, saying the retired doctor has a "pathological disease" with no cure, similar to being a child molester. "A child molester, there's no cure for that," Trump said. "If you're a child molester, there's no cure. They can't stop you. Pathological? There's no cure. If I did the stuff he said he did, I wouldn't be here right now. It would have been over. It would have been over. It would have been totally over," Trump said. "And that's who's in second place. And I don't get it. "So I have a belt: Somebody hits me with a belt, it's going in because the belt moves this way. It moves this way, it moves that way," Trump told the crowd, which laughed in response. "He hit the belt buckle. Anybody have a knife? Want to try it on me? Believe me, it ain't gonna work. You're going to be successful, but he took the knife and went like this and he plunged it into the belt and, amazing, the belt stayed totally flat and the knife broke." Many in the crowd were community college students who have never voted in a presidential election, along with teachers, local politicians and a number of farmers from the area, but Trump kept going on,gesticulating in the process. "How stupid are the people of Iowa? How stupid are the people of the country to believe this crap?" he asked. "He goes into the bathroom for a couple of hours and he comes out and now he's religious," Trump said. "And the people of Iowa believe him. Give me a break. Give me a break. It doesn't happen that way. It doesn't happen that way… Don't be fools, okay?" Trump told the audience that while he might not be "a perfect Christian" like Carson, he has leadership abilities unlike Carson. "I know how to do it," Trump said of the presidency. "I really know how to do it." On the Islamic State,Trump says he will bomb the "s*** out of (ISIS)" ,"I know more about ISIS than the generals do," Trump said. "Believe me". "I would just bomb those suckers. And that's right: I'd blow up the pipes, I'd blow up the refineries. I would blow up every single inch. There would be nothing left."